By Chris Scott Barr on 04/23/09 • Leave a comment! Are you one of the people that was convinced that HD-DVD was going to win in the epic HD format war? I really thought that it had a chance there for a while, but alas, Blu-ray won out. Sure, you can still watch those movies in all of their HD glory, but you still need to keep around an HD-DVD player for it. Well thanks to a new initiative by Warner Bros. you can trade in a few of those obsolete discs for shiny new Blu-ray versions. 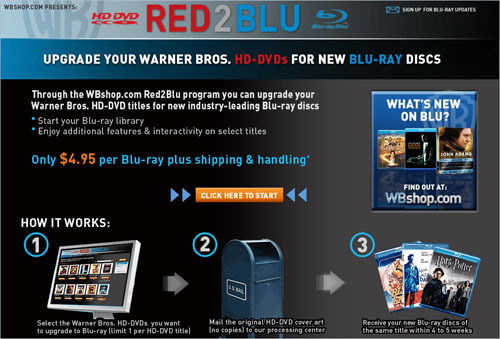 That’s right, gather up all of those Warner Bros. HD-DVDs and head over to the Red2Blu site and get yourself all set up. They’re going to ask for shipping and handling, as well as a small fee of $4.95 per disc. I really have to commend Warner Bros. on this. They don’t have any obligation whatsoever to provide an exchange program, but for the sake of their customers they are doing it anyway. I’d definitely get on this while it lasts. That reminds me, I need to hit up the cheap HD-DVD bin at Fry’s next time I’m out that way. By Chris Scott Barr on 02/19/08 • Leave a comment! 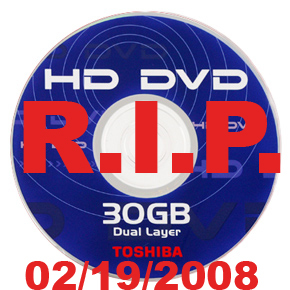 All around the internet people have been pronouncing HD DVD dead. The past week I’ve seen it on dozens of sites, however, it really hasn’t been official. Until now. 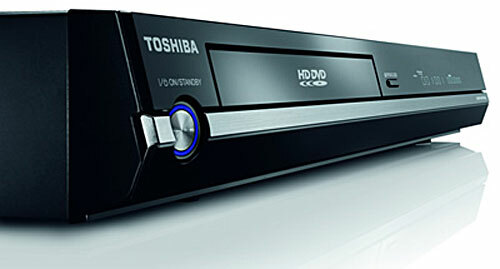 Toshiba finally issued a press release announcing the discontinuation of HD DVD business. You can imagine that glasses are being raised over at the Blu-ray camp as we speak. While I haven’t picked sides of the HD format war (see: haven’t actually bought a player), I have been silently rooting for HD DVD. Sure, I’m rooting for the underdog, but when you’re a Bears fan for so long, you get used to it. The reason that I think HD DVD could still snag a victory is the price. Toshiba broke the $200-mark late last year, which was a huge milestone. Now according to a new announcement, they’ve chopped another $50 from the low-end of their offerings. That’s right, you can now pick up a Toshiba HD-A3 player for just $149. Unfortunately this still doesn’t make up for the fact that most of the studios have jumped ship to the Blu-ray camp. I’m greatly saddened by this, as Sony has priced their players much higher than the competition, and when (if?) HD DVD goes under, I don’t see them lowering them for the fun of it. Just look at the PS3, they kept the prices as high as they could for some time, despite poor sales. Either way you look at it, the war is nearly over. I still think HD DVD has a chance, although it’s not much of one. I wouldn’t’ be surprised if the next six months was enough to give us a clear victor. By Shane_McGlaun on 09/05/07 • Leave a comment! Back in January LG made big news at CES with their BH100 Super Blu DVD player that could play both HD DVD and Blu-ray movies. LG announced today that they are bringing a new Super Blu dual format player to market in October called the BH200. Just like the original BH100 Super Blu, the new BH200 will play both HD DVD and Blu-ray movies and could be considered the Switzerland of high definition DVD players. LG points out that the BH200 can play 50% to 60% more movies than any other high def DVD player. The player supports 1080p video at 24 fps, 30 fps, and 60 fps and has Dolby Digital, Dolby Digital +, DTS, and DTS-HD audio capabilities along with HDMI 1.3 out. The BH200 will be able to enjoy all the extra features that single format players can such as Picture-in-Picture available on many Blu-ray discs and HDi web-connected interactivity available on many HD DVD movies thanks to Ethernet connectivity. The price isn’t cheap at $999; you could buy two separate players for the same money and perhaps even less. However, movie lovers looking for both format capabilities in one device will want to check the BH200 out.